Welcome to the first Monday Update of the Summer! It was a wild weekend in the hockey world with the NHL Draft taking place, the Vegas Golden Knights drafting their team, and now NHL teams are getting set for development camps in July. And I know you may not want to hear this but the days are now getting shorter meaning we’re getting that much closer to hockey season! A total of 89 players from the CHL were selected in the 2017 NHL Entry Draft over the weekend, including 33 from the WHL. 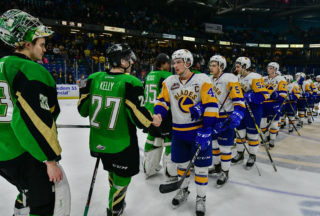 Unfortunately, no players from the Saskatoon Blades heard their names called. Josh Paterson and Mark Rubinchik were among the eligible players for Saskatoon who made the NHL Central Scouting Final Rankings list, and will now look to prove themselves heading in to the 2017-18 season. Former Blade and Saskatoon product, Brayden Schenn, was the centre piece of the biggest draft day trade on Friday when the Philadelphia Flyers sent the 25 year old centre to the St. Louis Blues in exchange for Jori Lehtera, the 27th overall pick in Friday’s draft, and another conditional pick. Apparently Flyers GM Ron Hextall figures Nolan Patrick will be able to step in and fill the void left by Schenn sooner than later. Lehtera will have to do in the mean time. The 2017-18 WHL Regular Season schedule is set to be released tomorrow, Tuesday, June 27th at 2:00pm. 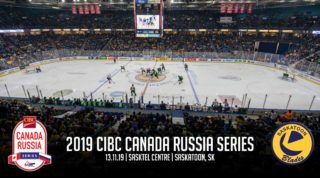 But as for right now we can tell you the Blades will open the season at home against the Swift Current Broncos on Friday, September 22nd at SaskTel Centre. It may be a tough task to top last year’s home opener of Thank You, Mr. Hockey Day, but stay tuned… we have some fun stuff in the works. Former Head Coach & General Manager of the Blades, Bob Woods, has been hired as an Assistant Coach with the Minnesota Wild. Woods spent two seasons with the Saskatoon Blades from 2014-2016 posting a 45-91-0-8 record. Woods left the Blades to take a job with Dan Bylsma and the Buffalo Sabres last summer, and will now be reunited with Bruce Boudreau whom Woods spent 5 seasons working with in the NHL split between Washington and Anaheim. They tandem also spent three seasons together in the American Hockey League with the Hershey Bears. Saskatoon Blades alumnus Braden Holtby added some hardware to his collection last weekend taking home the William M. Jennings Trophy at the NHL Awards in Las Vegas. The Jennings Award goes to the goalie(s) who allow the fewest goals against in a season. Also worth noting two former Blades and Saskatoon boys Mike Babcock and Todd McLellan were finalists for the Jack Adams Award. John Tortorella was the eventual winner; his 2nd Adams of his career. The CHL Import Draft is scheduled for this Wednesday at 9:00am CST. The Kootenay ICE have the highest selection of teams from the WHL at 3rd overall. 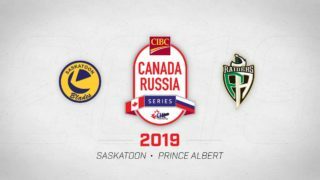 The Saskatoon Blades own the 15th overall pick but as stated earlier this Spring by GM Colin Priestner, the Blades will be keeping their two import players Mark Rubinchik and Libor Hájek and not making and picks in the import draft. Blades President, Steve Hogle, was downtown taking part in the 25th annual Saskatoon Pride Parade over the weekend. The parade was one of the largest in history with Mayor Charlie Clark leading the way as Grand Marshall. The two week long festival came to a close on Sunday. 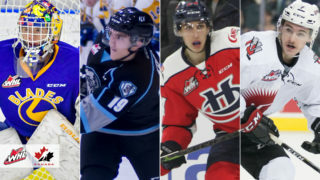 Several members of the Saskatoon Blades have or will be graduating from high school this week including Logan Christensen, Jantzen Leslie, Jackson Caller, and Jake Kustra. Congratulations boys! 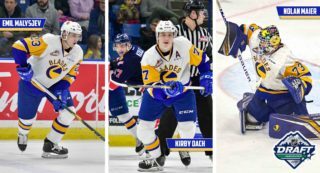 Across the pond a few Blades alumni are continuing their hockey careers. Colton Gillies signed a 1 year extension with Dinamo Riga in the KHL. Gillies spent parts of four seasons with the Blades scoring 91 points and racking up 310 penalty minutes in 195 career games. Matej Stransky is headed back to Europe after playing in the AHL for the past 4 seasons with the Texas Stars. The Czech winger signed a two year deal with Severstal Cherepovets of the KHL. Stransky had an impressive career in the WHL; 193 points in 213 games over three seasons with the Saskatoon Blades. Lastly, Martin Erat is still at it. The veteran forward signed a one year deal with Kometa Brno of the Czech Extraliga last week. Erat was selected 6th overall by the Blades in the 1999 CHL import draft and played a season and half in Saskatoon.